Città di Castello | Travel Umbria! Città di Castello is Umbrian’s northern most town, as well as the largest town in the Tiber valley. As a gateway to Umbria from anyone approaching from the north, and situated between Le Marche and Tuscany, the town is in a perfect position in regards to trade with other regions. A noble looking town, Città di Castello is often off the beaten path from most tours of Umbria, but is well worth a day visit if you are in the area. Situated on the right bank of the River Tiber, it’s architecture has a Tuscan influence and does not follow the usual medieval pattern and is still surrounded by majestic 16th century walls today. How To Get To Città di Castello – From Perugia take the E45 highway in the direction of Cessena and exist at Città di Castello. Trains also run from both Perugia or Terni on the private FCU line, or from Sanselpolcro to the north. The train station is just a short five minute walk from the center of Città di Castello. Parking is situated all along the outer walls of the city. What To See In Città di Castello – The city was created by the Vitelli, the occupants of its castle between the 15th and 16th centuries who both renewed the town’s layout, but also its dwellings. You can see their influence in their large family palaces, one in each district, all quite splendidly decorated and containing many famous works of art. The Duomo in Piazza Gabriotti dates back to the 6th century, but was renovated again in 1466 after an earthquake, and again in 1529. During the 17th century a Baroque frontage was initiated but later abandoned. The round bell tower is part of the original 11th century building retaining the Romanesque appearance, but the Gothic influence can be seen in the left-handed doorway which is adorned in twisted columns and relief. The interior with it’s single nave and 18th century ceiling is adorned with 16th and 17th century alter pieces. The large building next-door houses the Museo del Duomo. Just east of the Duomo in Piazza Gabriotti one finds the Palazzo Communale (Palazzo dei Priori), or town hall, that was begun in 1322 by Angelo da Orvieto which has a very rustic sandstone facade adorned by an elegant doorway. Opposite stands the Civic Tower, another 14th century building, decorated with coats-of-arms. From the top of this tower which is open daily, for a small fee one has great views overlooking the town and surrounding countryside. Palazzo Vitelli alla Cannoniera is a 16th century palace that was built for the Vitelli family by Antonio da Sangallo with a facade by Giorgio Vasari and now houses the Pinacoteca Comunale, an art museum that is second only to Perugia’s larger art gallery for Umbrian paintings. Via della Cannoniera 22a. On Corso Cavour which runs east of Piazza Barbriotti stands Palazzo del Podesta. The facade dates back to the 14th century and is thought that the original design was also by Angelo da Orvieto. Chiesa San Francescowas originally started in the 13th century, and it was later worked on by the famous Florentine painter and architect Giorgio Vasari in the 1500′s, although it was almost completely remodeled during the 18th century. Vasari was responsible for the lovely Cappella Vitelli as well as an alter with Cornation of the Virgin. Between Piazza Garribaldi and the Pinacoteca is the largest church in town called San Domenico. It was built by the Dominicans in the 15th century and later remodeled although the facade to this day remains unfinished. It’s nave contains some very lovely 15th century frescoes well worth checking out. Collezione Tessile de Tele Umbracan be found just off of Piazza Matteotti at Via Sant’Antonio, and is a textile museum annexed to a small textile workshop that was set up in 1908 by the Franchetti family. It is still in operation and creates some of Umbria’s famous linen textiles using centuries old methods. Festival dell Nazioni – (Chamber Music Festival) Runs late August to early September. Mercato del Tartufo – This well known truffle show and market is held every November in the city center. 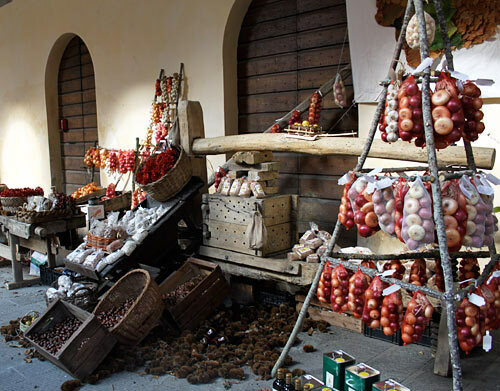 Markets – Citta di Castello’s weekly markets are held every Thursday and Saturday. A large flea market called Fiera del Riggattiere is held on the third Sunday of every month between the hours of 8am and 8pm.